(from metadata) This raster was produced by resampling the Kuparuk River watershed DEM at 10 meters. The original raster was 5 meters. 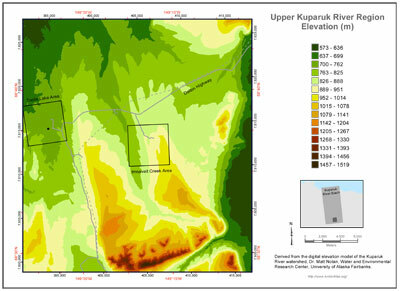 In spring of 2002, the National Science Foundations Arctic Logistics and Research Support Program funded the acquisition and distribution of a new Digital Elevation Model (DEM) of the Kuparuk River watershed in Arctic Alaska. This grant (NSF OPP-0207220) was awarded to Dr. Matt Nolan at the Water and Environmental Research Center (WERC) at the University of Alaska Fairbanks (UAF). Funding for some of the analyses was also provided by the International Arctic Research Center (IARC) at UAF. This set of eight DVDs is the result of that project. Access to these data are authorized only to scientists working on projects funded by the National Science Foundation. Please contact Dr. Simon Stephenson at the NSF (sstephen@nsf.gov) if you have any questions regarding your eligibility.